"Odilon Redon: Prince of Dreams (1840–1916)"
Fig. 2. 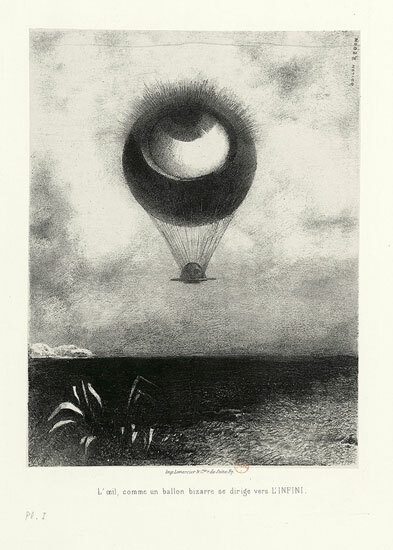 Odilon Redon, L’Oeil, comme un ballon bizarre se dirige vers l’infini (The Eye Like a Strange Balloon Mounts Toward Infinity) (1882), lithograph, 25.9 x 19.6 cm. Photo: ©Bibliothèque nationale de France. “Odilon Redon: Prince du Rêve,” the massive show at the Grand Palais, is at its heart a print exhibition. 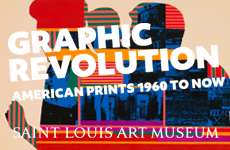 Despite the presence of some 170 paintings, pastels, and charcoal drawings, it is the one hundred or so prints here (most on loan from the Bibliothèque nationale) that dominate the proceedings. This is not surprising—Redon was primarily a graphic artist; he not only exploited the practical reproductive potential of print but also found that the rigors of black and white encapsulated his dark visions with unique intensity. At the Grand Palais, pride of place is given to Redon’s lithographic albums, ten of which (he only made twelve) are presented in their entirety and in the order designated by the artist. (Among the documents displayed here is the artist’s livre de raison, in which he noted the titles and dates of his works). It was in these albums that Redon’s idiosyncratic fantasy imagery, so distinct from both the artistic Impressionism that he despised and the modish literary realism of writers like Emile Zola, evolved in its most uncompromised guise. From 1879, when he published his first album, Dans le Rêve,1 Redon consciously set about establishing his reputation through the relatively dispersible medium of print. He may have been encouraged by the positive critical reaction to Henri Fantin-Latour’s sophisticated lithographic experiments of the mid-1870s (in fact, he relied on Fantin-Latour’s workshop, Lemercier & Cie, the largest in Paris, to edition his lithographs until early 1887). But he saw lithography in the first instance as a medium for reproducing the many charcoal drawings he had lying around, none of which had met with much success at that point. Dans le Rêve, a series of ten lithographs on chine appliqué, published by subscription in only twenty-five copies, made Redon’s name in literary circles, as he had hoped. The small edition not only represented a realistic assessment of the limited audience for this material, it also served to enhance the exclusivity of Redon’s albums within the small community of connoisseurs for whom they were intended. The images in Dans le Rêve unfold like scenes in an unsettling dream, and introduce some of the characteristic motifs of Redon’s art: the Alice-in-Wonderlandish quality of bizarrely juxtaposed scales and subjects like the figure in Le Joueur2 (Plate 5; Fig.1) seen carrying a disproportionately large die across a shadowy, sparsely wooded landscape, or the tiny human couple in the foreground of Vision (Plate 8), dwarfed by the vast eyeball floating between two giant columns. There are lots of disembodied heads here too (another distinctive feature of later work), among them the winged version in Gnome (Plate 6) and the delicately featured and horridly alert specimen on a footed dish (Sur la Coupe, Plate 10). These prints reveal an informed and passionate relationship to the masters, among them Dürer, Rembrandt, and Goya, sometimes through their subject matter, sometimes merely in the refinement of technical style. At the same time, however, they are avant-garde, even proto-Surrealist in their details, relentlessly championing imagination over traditional forms of representation or the experiences of modern life that preoccupied so many of Redon’s contemporaries. Fig. 3. 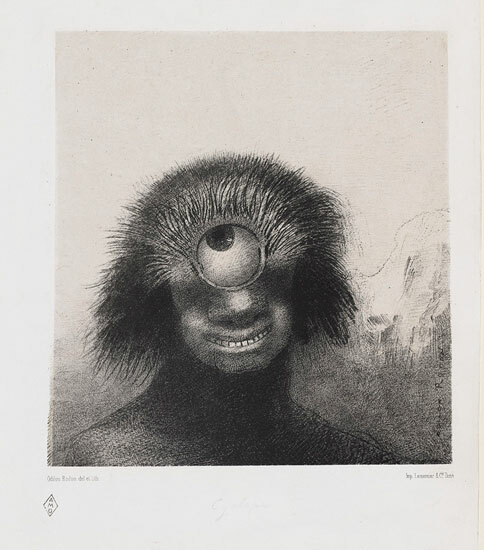 Odilon Redon, Le polype difforme flottait sur les rivages, sorte de cyclope souriant et hideux (The Misshapen Polyp Floated on the Shores, a Sort of Smiling and Hideous Cyclops), plate 3 from the portfolio Les Origines (1883), lithograph on chine appliqué, 21.3 x 19.9 cm. Indeed, Redon strenuously rejected the word “illustration” to describe the prints in his albums. “A word needs to be found: I can only think of transmission, interpretation, but even they are not quite right to describe what happens when my reading flows into my arrangement of black and white.”4 Nowhere perhaps is this more apparent than in Redon’s third album, Les Origines of 1883, surely one of his most singular achievements. This visual interpretation of the theory of evolution emphasizes, above all, the artist’s fascination with deformity and distortion in both human and animal forms. The images and cryptic captions suggest rather than describe in any scientific manner, the strangeness and chaos of primeval life up to and including the emergence of mankind. Some of Redon’s hybrid creatures are, like the siren in Plate 45 and the satyrs in Plates 56 and 6,7 drawn from classical rather than natural sources, and most incorporate some element of the grotesque. The grinning head in Plate 3 (Fig. 3), dominated by a single giant eyeball and titled Le polype difforme flottait sur les rivages, sorte de cyclope souriant et hideux,(( (The deformed polyp floated on the shores, a sort of smiling and hideous Cyclops.))) is especially notable in this context. This is no scientific record but a disturbing monument to an extravagantly visionary sensibility. Redon’s capacity for self-promotion was apparently as boundless as his imagination. Many of the albums shown here are homages to well-known literary and artistic figures such as Poe, Goya, and Flaubert, and point to the artist’s self-conscious awareness of his place in history. They also clearly reflect the specific tastes and interests of the numerous patrons and critics whose attentions Redon tirelessly sought to attract throughout his career. It was no coincidence that his album Homage à Goya (1885) became the best-known of his works; his friend Joris-Karl Huysmans published an article about it in Félix Fénéon’s journal La Revue Indépendante in February 1885 and assisted the artist with a strategic donation of the album to the poet Stephane Mallarmé the same year. This was followed in 1889 by the gift of the newly published album À Gustave Flaubert and later an inscribed copy of Dans le Rêve. It worked: Mallarmé was entranced by the albums and became a significant patron and supporter. Redon made many such donations to individuals and institutions: copies of the Flaubert album were given to Edmond de Goncourt and Emile Zola in 1889, for example, and four lithographs to the Rijksmuseum as late as 1909. In the mid-1880s Redon also began to supplement the albums with single prints, about fifty in all, that allowed him to sell to collectors who could not afford albums or who preferred individual sheets for framing and display; this also reduced the risk of albums being broken up. 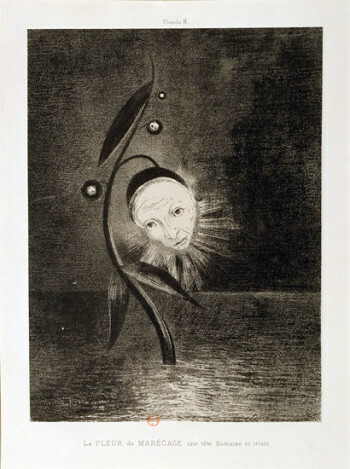 Odilon Redon, La fleur du marecage, une tête humaine et triste (Flower of the swamp, a head human and sad) (1885), lithograph from the portfolio Homage à Goya (1885), 27.5 x 20.5 cm. Photo: ©BNF. This unusually comprehensive exhibition makes clear how Redon’s initial interest in lithography as simply a reproductive tool evolved into an understanding of the medium in its own right as a vehicle for his prodigious artistic creativity. In fact, it was Redon who extended to lithography the notion of the “original print”—a signed and numbered sheet within a limited edition, and largely hand produced, a concept long associated with intaglio prints. However, he disliked working directly on the lithographic stone, preferring to draw on specially prepared transfer paper which was passed to the printer, who then transferred the design to the stone. 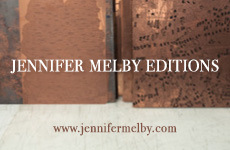 As he wrote to André Mellerio in August 1898: “Transfer paper is excellent for improvisation. I like it very much for it responds better than stone … which scarcely allows for the adventurous darings of my fancy. The paper yields, the stone holds.”8 Ted Gott has described Redon’s working process in which revisions made by the artist on a trial proof would then be applied to the stone in the workshop.9He also made corrections to the stone himself with a variety of lithographic crayons and scrapers. The final prints were made mostly on chine appliqué; the lithographic image was applied to the thin China paper that was mounted under pressure to a backing sheet of thick white wove stock. 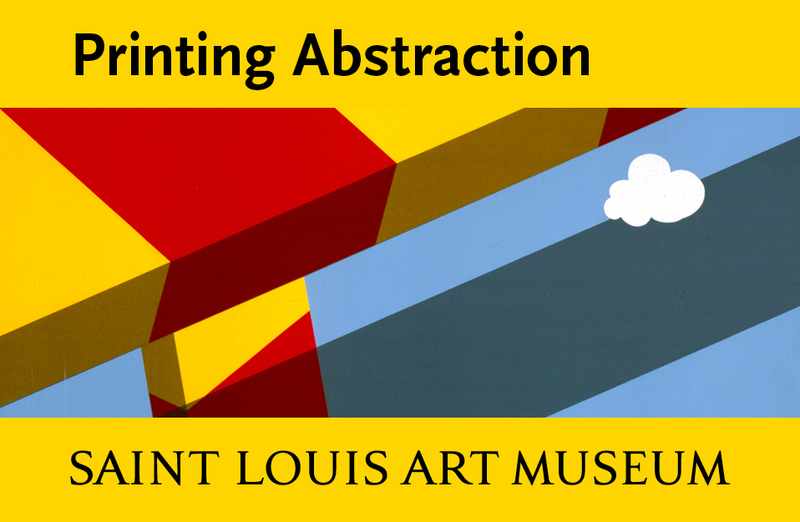 This accounts for the distinctively flat, white appearance of most of the prints—one that aroused suspicion among certain visiting print specialists to the exhibition, one of whom even suggested that the sheets might have been pressed and bleached by the Bibilothèque nationale (sacré bleu!). After 1890, as the curators note, “painting and pastel gradually invaded [Redon’s] somber dream world.” And indeed, in the second part of the exhibition, sequestered on a lower floor of the gallery, black-and-white ruminations are summarily abandoned in favor of an Oz-like territory of vivid Technicolor. (Redon’s flower paintings and pastels enjoyed a burst of prominence in the art market of the 1970s and ʾ80s, when they were discovered by the same Japanese collectors who were busy pursuing Chagall and Renoir. There were retrospectives at the Museum of Modern Art Kamakura in 1973 and at the Museum of Modern Art in Tokyo in 1989, and the period in-between was punctuated by record sales of Redon’s work to Japanese collectors. Of course, since the bubble burst at the end of the eighties, the market for these works has been in significant decline.) There is an entire room full of pastels of flowers in vases that suggest a slightly gaga Sunday painter at work (whither creepiness? )—and are best passed over at considerable speed. But even the gloomiest print specialist might find some joy in Redon’s glorious and colorful late designs (1900–1901) for the fifteen decorative panels in the dining room of the Château de Domecy that close the exhibition. 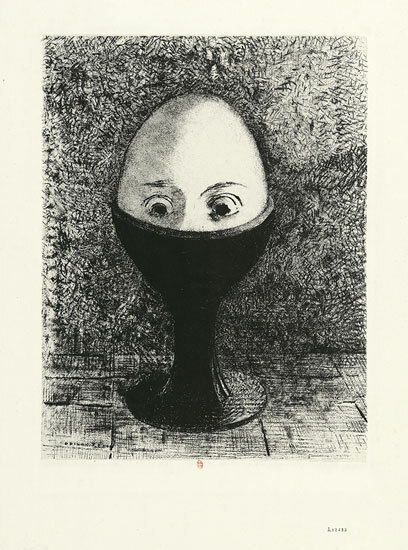 Odilon Redon, l’Oeuf (the Egg) (1885), lithograph, 29.3 x 22.5 cm. Photo: ©BNF. If black-and-white seems, for the most part, to have been a more effective vehicle for Redon’s sinister reveries than color, lithography also served him well strategically. Indeed, Redon’s effective exploitation of prints has a great deal to do with the odd insider-outsider status he enjoyed in his lifetime and that has attached to his reputation ever since. As the exhibition underscores, he was not a popular printmaker in the mode of Daumier, but an artist comfortably settled in the French tradition of the deluxe edition. The lithographs in which his powerful Symbolist imagery emerged were always both exclusive and expensive; his primary audience was the sophisticated literary and artistic circle of the “Decadents,” and it was they who supported his career. Although Redon was almost the same age as Monet and Cézanne, he shared none of their radical engagement with the forms and appearances of the modern world. And his resistance to social and political concerns probably marginalized him further, at least in terms of a wider public audience. Among scholars and serious collectors of works on paper, Redon’s artistic importance, however, has never been questioned. There have been numerous museum and gallery exhibitions of his work over the past century, including a 1994 retrospective at the Art Institute of Chicago (also subtitled “The Prince of Dreams”); the Museum of Modern Art’s “Beyond the Visible: The Art of Odilon Redon” in 2005, which showcased 140 paintings, drawings, and prints from the Ian Woodner Family Collection, and a 2007 show, “Odilon Redon: Wie im Traum /As in a Dream” at the Schirn Kunsthalle, Frankfurt. But as the exhibition at the Grand Palais establishes, however distracting the artist’s pleasing decorative schemes and vivid colors can be, it is ultimately the dismembered heads, floating eyeballs, and nasty hybrid beasts of his monochrome kingdom that long hover in the memory. These are the crowning achievement of the prince of dreams.